True love can’t be put into words. When you find yourself deeply in love with someone, nothing you could possibly say would ever make them fully aware just how crazy you are for them. 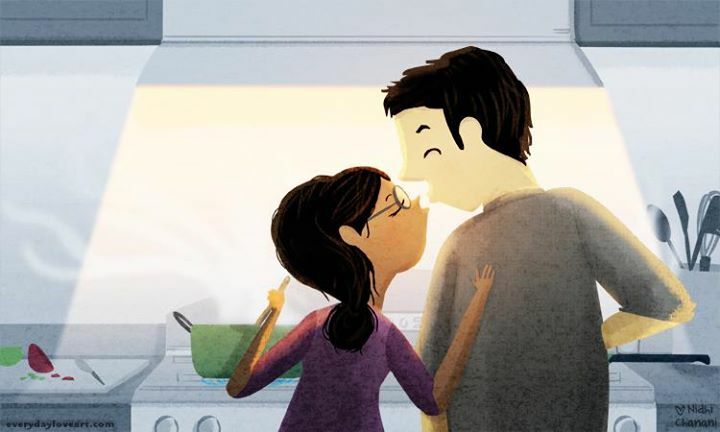 Nidhi Chanani knows this, and so she created a series of illustrations showing the love between two characters who are absolutely over the moon for each other. Through these beautiful drawings, Chanani accurately presents a picture-perfect life shared between two soulmates. When you love someone, you can be doing two totally different things, but never be truly alone. Although these two lovebirds are reading two separate books, they are still enjoying each other’s company to the fullest extent. Even when deeply engrossed in a fictional world, the two are still there to remind each other of how much they care for one another. Even though you can’t hear it, you just know he’s playing her favorite song right now. He might be too nervous to ever play in front of a crowd, but for his one and only, he’ll belt out each line to any song she wants to hear, regardless of how bad he thinks he sounds. And it doesn’t even matter if he sounds terrible; the look in her eyes makes it clear how content she is in this single moment. I’m willing to bet this guy would never go on a picnic with anyone other than his love. When you’re with your soulmate, you can do absolutely anything and have the time of your life. All it takes is a blanket, some watermelon, and a nice breeze, and this couple has everything they need to create a memory that will last a lifetime. My wife and I love to learn from each other. I teach her meaningless information about sports (like how to calculate slugging percentage), and she teaches me about God, how to cook new recipes, and why I should take my contacts out every night. Even seven years into our relationship, there’s still so much we have to learn about each other. It keeps everything fresh, knowing that there’s always more to teach, and always more to learn. No matter how old you get, being in love keeps the kid in you alive. When you’re with the one you love, you can be silly, make a fool out of yourself, and act like your five years old again without worrying about who’s watching you or laughing at you. You definitely have different tastes in hobbies, music, television, and more, but you begin to appreciate certain things more simply because you know your soulmate likes them. You start listening to the music your love enjoys, or watching the TV shows you know they’re obsessed with, even when they’re not around. When you’re in love, both of your interests rub off on each other, and become a part of who you are. If you got caught in the rain alone, chances are you’d be pretty upset about it. But just look at these two: they’re having the time of their life! They could choose to be miserable, but they’ve made the most of a dreary situation, and, again, are creating a memory that will last forever. Whether either literal or metaphorical rain clouds appear overhead, having someone by your side makes it easier to deal with them. Through all the good and bad times they’ve faced, this couple is clearly as in love now as they were twenty or thirty years ago. They’ve kept their love alive by never being afraid to show it, and clearly appreciate every single moment they have together. When you fall in love, you cherish every second of every day, knowing that life is so much better with your true love by your side.